For a while now, I've dreamt of having a bicycle that matched my MINI. I finally think I found it. 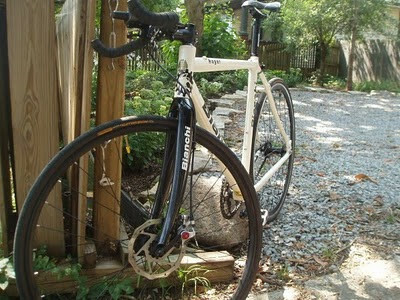 Not only is this Bianchi the perfect color scheme, this techie little fixie is philosophically MINIesque too. It's light, tight and packs a few tech goodies. 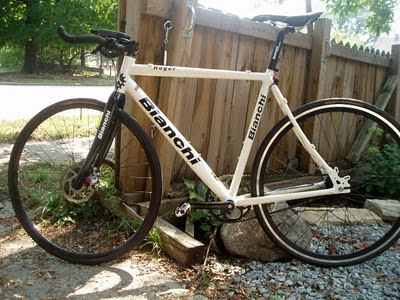 I discovered this whip on myfixedgear.com—which Mrs. Kyality can attest is kinda my new sickness. Can you imagine how rad this would look on top of my Clubby??? It's kinda awesome that you always think about how the bike would look on your car... and not how you would look on the bike or how it would ride... Bikes as car accessories? That's a conundrum. I really don't know to which of my Clubman or Cannondale I have a stronger emotional attachment.